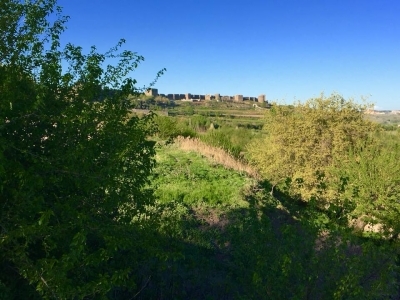 'Diyarbakir Fortress and Hevsel Gardens Cultural Landscape' comprises a fortified settlement along the Tigris River, which played an important role in many civilizations. Its long history include Roman, Byzantine, Umayyad, Artuqid, Seljuk and Ottoman periods. Visited April 2018. 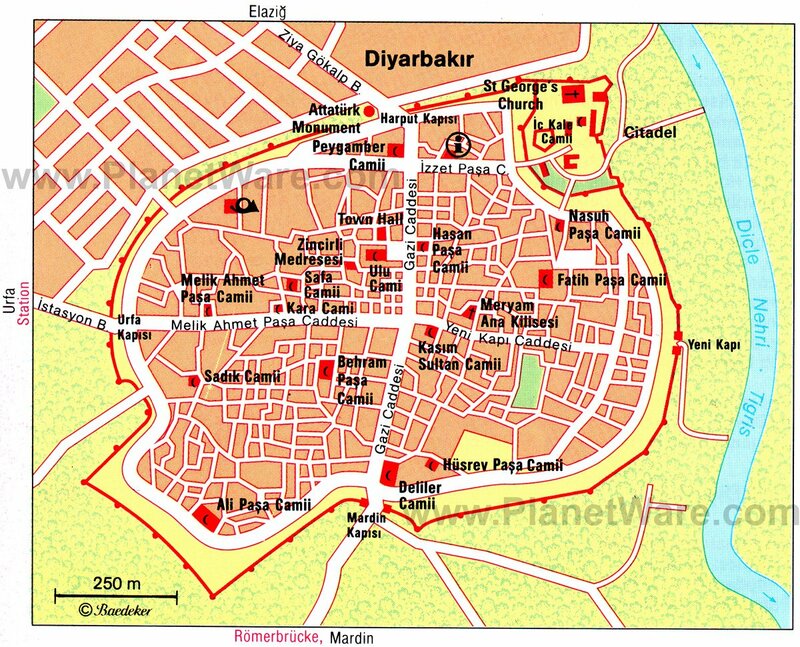 Diyarbakır is the unofficial capital of Turkish Kurdistan. The city is really big and still booming thanks to the GAP Project, but the part interesting for tourists is located on its eastern outskirts, closer to the Tigris River. The Kurdish people call the city Amida as it was named two thousand years ago. I have very mixed feelings about this inscription that was put into WH List 2015 after ICOMOS referral. Surely it is not my favourite WHS in Turkey although I have to admit that the inscribed part has a kind of a charm… There are 6 components which constitute one rather big unity: Içkale with Amida Mound, City Walls, Hevsel Gardens, Ten-Eyed Bridge, Natural water resources, Tigris River Valley. 1. Tigris River Valley. It is hard to believe that this river (locally called Dicle) together with Euphrates gave birth to Mesopotamian civilization. Now Tigris is just a 30-meter wide, shallow and dirty. Only eastern bank of the river has a walkable path, the one on the citadel site is partially in the private hands so wired fences are not uncommon. 2. Natural water resources are the most difficult to find. Just west of the outer walls, between Urfa and Mardin gates, after a moment of wandering around and asking locals, you can see Anzele Spring. Now it looks like a small pool, some of it hidden in the tunnel. Children are playing around, 3. Ten-Eyed Bridge is located around 3 km south of the Mardin gate. The first bridge was built here in the 11th century but what we can see now it the result of many later reconstructions, the last one at the end of the last century. It looks nice and links both sides of the Tigris – but nothing interesting where to follow. During hot days lots of places open around the bridge where you can have some tea, coffee or local drink. (Forget about any alcohol! You won’t officially find it anywhere in this part of Turkey.) 4. Hevsel gardens – in my opinion the most valuable part of this cultural landscape but not the most enjoyable to look at – “throughout its millennia long history have been open to the benefit of the public instead of being allocated to the palace, the noble and aristocracy” (from the very short description in the city museum). They’ve been used to grow food for at least 8 millennia. Today they are nothing more than some grooves, meadows and still cultivated fields with some mulberry and poplar trees. (On the photo with city walls in the background.) 5. More than 5 km long City Walls with its many gates and 82 towers buttresses in different shapes and sizes. The oldest parts were built by Romans and you can still see a Latin inscription at one of the gates. Most of them are quiet intact, only two stretches were demolished in the 1930’s to make way for modern roads. At your own risk you can walk on them, the best part is from Urfa gate to Mardin gate. You can also make an extra-muros circuit and then you’ll have a chance to see most of the inscriptions belonging to Islamic period (don’t miss Ben u Sen and Yedi Kardes bastions). Coming from west, you’ll pass some poor neighbourhood where old houses are still stuck to the walls. Intra-muros circuit is not possible right now, because few years ago the government demolished the whole Armenian quarter to build “more traditional” houses (whatever it means). But at the southern entrance to this part of the city stands Goat Bastion, one of the biggest, where Zarathustra temple was located – you can have a look inside. Most of the towers and bastions that served as storages and arsenals are empty now. 6. 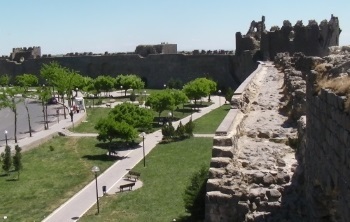 Içkale with Amida Mound is the oldest part of the city and has its own walls. After the revitalisation that was made few years ago it looks like a city picnic spot. It is small, but divided in three parts: the picnic area, the museum are Amida mound which is not open for tourists. So if you’re there, see the museums: archaeological and city museum are recommended. If you want to get some more info about the city, try in one of the two information centres. One of them is located in Dag Kapi Bastion and the other just behind it in kiosk on Dag Kapi square. In both you can grab some leaflets and maps. If you’re looking for a UNESCO WH sign, I could not find it anywhere around the property, but inside a local governmental institution that look after the cultural heritage of the city (it’s located to the right of the main entrance to Friday mosque, a place not to miss!) there’s a kind of diploma on the wall with the information that the city (?!) was inscribed (ask the guards to let you in). If you’re staying longer than a day, you can make interesting day trips to see Nemrut Dagi (WHS) (only organized tours) or some places from Tentative list: Mardin and Deyrulzafaran Monastery, Malabadi Bridge, and even Gobekli Tepe and Sanliurfa. Irrigation and drainage: "The Anzele Spring is located in the west part of the City Walls. It provides for the water needs of many mosques in the city, houses and gardens to the Urfa Gate, powers the mills outside of Mardin Gate, and irrigates the Hevsel Gardens".